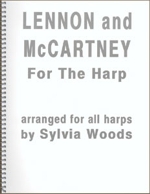 46 of the most popular songs by John Lennon and Paul McCartney have been arranged for the harp by Sylvia Woods. All of these Beatles songs can be played on both lever harp and pedal harp. When necessary, there are separate arrangements for lever harp players who tune their harps to 3 flats, as well as lever harps tuned to the key of C. A few songs have separate pedal harp arrangements. For intermediate to advanced harp players. Some of the pieces are quite easy, and others have extensive sharping lever/ pedal changes. Lyrics and chord symbols are included. 144 pages, spiral-bound.